GOOD MORNING my creative friends & welcome to another 3-D Wednesday! Well, for today's projects, my FABULOUS design team & myself are showcasing "Home Decor" items! Sooo, with that said, I decided to decorate this crystal votive holder I had & turn it into a candy dish! I'm still deciding whether I should keep it on my craft table OR put it out in the living room w/all of my other Halloween decorations! ;) I have been tremendously inspired by my FABULOUS design team! Today, my project was inspired by Miss Ruthie! Like I mentioned in my video below, here is the link to Miss Ruthie's video on how you can alter our dies so you can STILL have MY BEAUTIFUL stitching there! I just LOVE my "Treats for my Sweets" stamp set! It was PERFECTO for this project! In this picture, you can see how CUTE my little "Shrinky Dinky" ghost looks! I used my "Just Tags" for the ghost shape! Isn't it WAY TOOOOO CUTE??? I LOVE how it came out! Here is a video tuturial from Miss Ruthie showing HERE 'shrinky dinky' technique! LOVE all these 3d projects Emma!! Everyone did an amazing job!!!! Thanks for another fun day of inspiration and have a GREAT hump day!! You have an incredibly talented design team. Love all the projects. Your project is awesome. If it were mine, I'd display it in the living room. 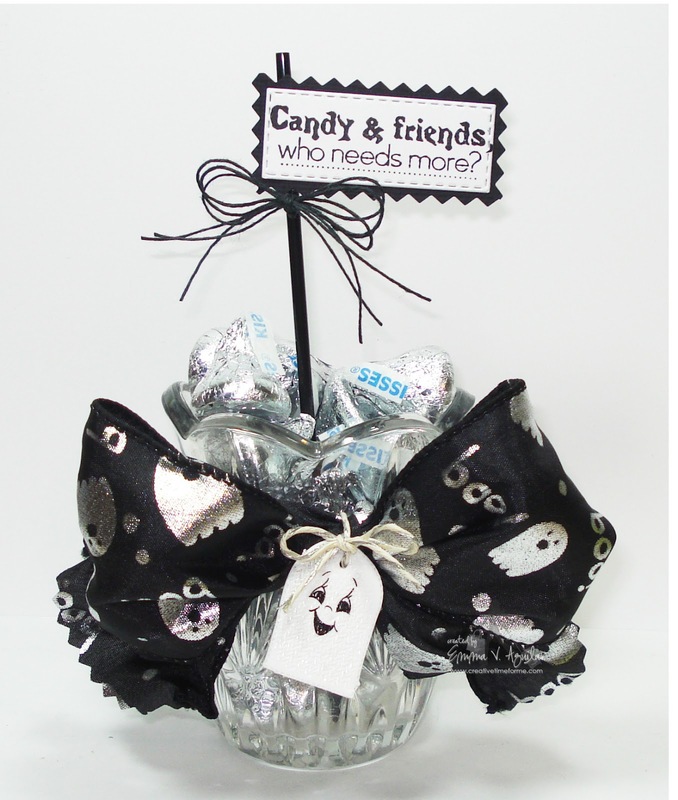 I really like the shrinky dink ghost on the candy project. Great idea. This turned out so cute, Emma! I love your shrinky-dink ghost!!! Wow! 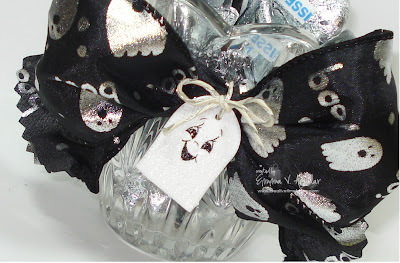 I love the little ghost and how it coordinates perfectly with the ribbon. Of course I don't think the kisses would have lasted long enough for a picture in my hours! Emma ~ ADORABLE and so CREATIVE!! Using a votive first of all ( I have a ton I don't use anymore around the house) and making it a candy dish! Well I LOVe the little ghost, the tag and of course the ribbon, hemp & coffee stir! OMG!! Such creative ideas here! I have to say Miss Ruthie blew me away with the shrinky dink thing and thehow to use your fabulous dies too! AWESOME, AWSOME 3~D home decor project!! I did laugh at the spoon comment! I TOTALLY agree with your son! We go through so many spoons a day! Smart boy!!!! So cute! I need to make some of these for my friends:) DT you did a fabulous job, like always! Wow! This is such a great idea! I don't have anything like that in my house, my boys can be a bit rowdy...we stick to plastic. :) Anyhoo...I LOVE it! And fabulous job by the design team! Totally in love with the Treat project!! Fabulous and Fun DT projects!! oh my goodness, this ADORABLE!!!!! Oh how CUTE!! Love this Emma! The DT projects are awesome too. Some major inspiration going on today! 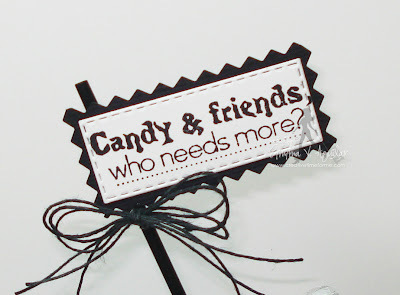 I am suffering from great ideas over load...I need some of those chocolate kisses. Everyone did such a great job and had wonderful projects. Wow girls you did an awesome job!! I'm loving this blog, I am commenting to get in on the charm giveaway too, hope I'm at the right spot! Thanks for sharing all of these awesome Halloween ideas!